Frederick Douglass died in Anacostia Heights, DC, in 1895. He was born in Tuckahoe, Maryland, probably in February 1818. He escaped from slavery and became a popular abolitionist and speaker. 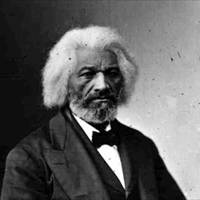 Children can learn more at Frederick Douglass. Children can also read some of his works at Project Gutenberg. John Herschel Glenn in 1962 was the first American and the third person to orbit the earth. He circled the earth in Friendship 7 three times in almost five hours. In 1998, at the age of 77, he returned to space on the space shuttle Discovery. Mir space station was launched by the Soviet Union in 1986. It was home to both Russian and American scientists until March, 2001. Ansel Adams (born San Francisco, California, 1902; died Monterey, California, April 22, 1984) was a very famous photographer. He was commissioned by the National Park Service in 1941 to photograph nature. Children can view many of these photographs at: Ansel Adams. Richard Matheson (born Allendale, New Jersey, 1926; died Los Angeles, California, June 23, 2013) wrote science fiction books. His works include I am Legend and Other Kingdoms.